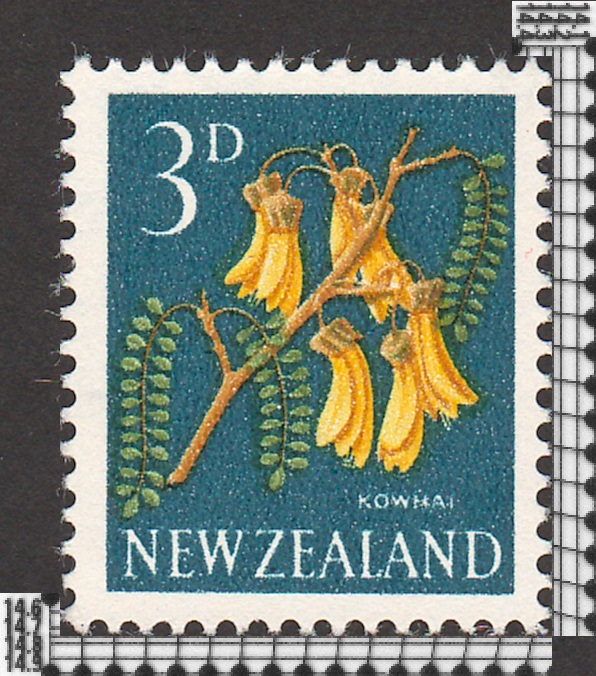 I have about a zillion New Zealand 3D Kowhai Flower, Scott # 337. The question I have are in perf's. Ok now, I have a 14 1/2 x 14 and also a 14 1/2 x 14 1/2. Watermarks are not sideways as listed as 337e. But where does a 14 1/2 x 14 1/2 fit in and for the record they were checked using multiple gauges and there is a difference between the two perf's? What does the Stanley Gibbons catalog say for those that have one? 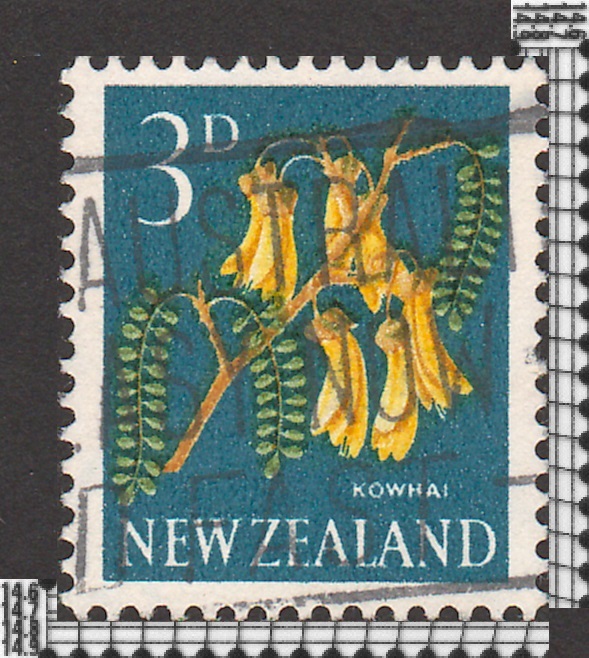 Scott New Zealand #337e is the coil version of the stamp. Unlike US coils, it is perforated on all 4 sides. Therefore the only way to ID the coil is by either measuring the perfs or checking the direction of the watermark. I'll check my SG, Michel, and ACS New Zealand, as well as my NZ album and see what I can dig up regarding the perf 14.5. My Lighthouse New Zealand album has spaces for the same perforation varieties/measurements listed in Scott. SG -- I only have the Simplified Stamps of the World catalog, not the regional catalog. SotW does not provide perf measurements and doesn't even assign a different catalog number for the perf varieties. 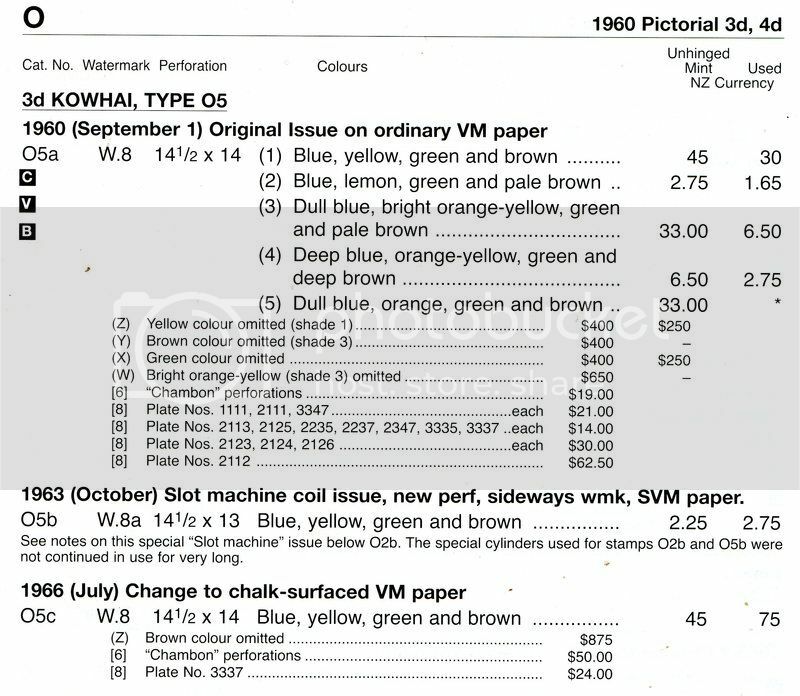 While it would be great for someone to provide the SG regional catalog info for New Zealand, the difference between Scott and Michel listed perforation for the sheet stamp got me thinking... (always dangerous). Scott and Michel both have an annoying habit of rounding off fractional perforation measurements to the nearest ½. Unfortunately, both are inconsistent in which way they round off! I measured mine with a fine fractional gauge -- the sheet perforations are actually 14.75x14.25! Since they round off inconsistently, that explains why Scott says 14.5x14 and Michel says 15x14. Now I've got a hypothesis on what "might" have happened to the stamp which you are sure you measured 14.5x14.5. I've run into perforation shifts enough to recognize this possibility. Let me see if I can find an example, scan/post/explain, and then we can see if your stamp might have a perforation shift. tomd is it convenient for you to post a scan of the stamp you measured perf 14.5? Thanks! Meanwhile, let me fill in the time by posting some info about perforation anomalies, and then my "guess" as to what might have happened (we'll find out whether I was right or wrong when tomd posts the pic). First, some background. The sheet version of this stamp was perforated by a comb perforator. A line perforator makes one complete line of perfs at a time, and then the sheet must be rotated 90º and run through the perforator again. A sign of line perforations is that the perf hole doesn't always perfectly coincide at the corners. A comb perforator will perforate two or more adjacent sides simultaneously, so assuming no errors, the corners will have a clean single perforation. The pin configurations for a comb perforator may be of different shapes, such as L, E, T... where the intersection of the letter lines is the stamp "corner". 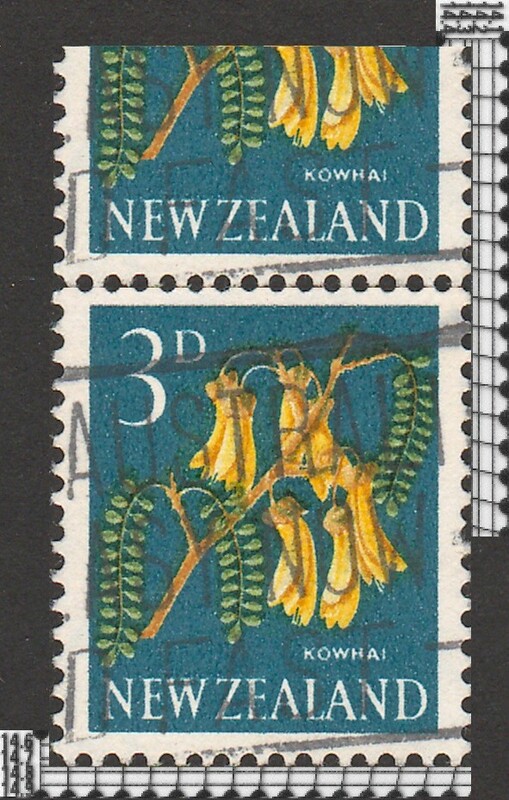 The sheet version of the New Zealand 3d stamp that tomd mentions was comb perforated, I assume by a T perforator (I'll show in a later post why I came to this assumption). Just like there are perforating errors/freaks caused by line perforators (imperforate in between errors, shifted line of perfs freak...), there are also errors/freaks for comb perforators. One type of freak that I like to collect, is what I call a perforation jump. I didn't have one for this particular stamp until tomd's question inspired me to look for one. 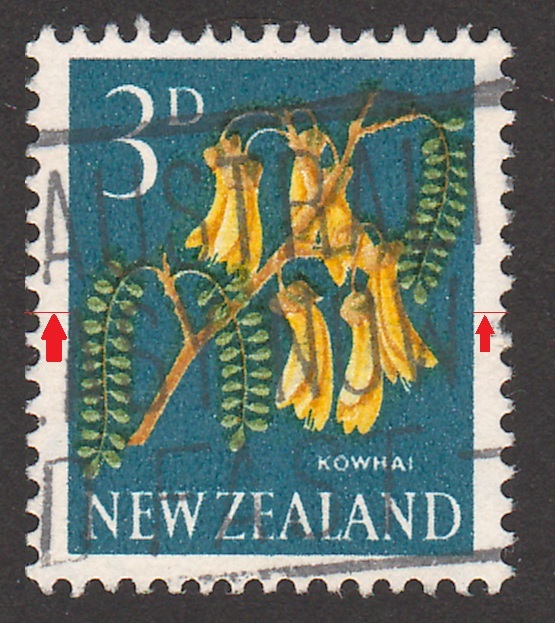 First, a "normal" Scott New Zealand #337 stamp is shown below. I have superimposed it over a decimal perforation gauge to show that the perforation for the sheet stamp is actually 14.75x14.25. Sorry, I put the horizontal (first) perforation measurement at the bottom instead of the top because it was not convenient for me to superimpose it at top. So in the pictures with gauge measurements, look at the bottom first, and then the side. Now here is a stamp with a perforation jump (I'll explain later, just notice the side perforation measurement). Surprise, it "appears" to measure 14.75x14.75 (or 14½x14½ if we round like Scott does). This stamp was comb perforated using what I assume is a T-perforator (at least that's what I call it, I don't know the official name). The ends of the T don't always line up properly. As a result, you can get a "jump" in the perforation in almost any direction. It can cause an off-line shift, or create a larger gap between 2 perf holes, or scrunch 2 perfs close. The example I showed is the latter case. In the picture below, I marked in red how the T perforator shifted the perfs up, causing 2 perf holes the scrunch together (you can see this on both left and right sides). This causes what should be perf 14.25 to measure perf 14.75! In this particular example, the perforation jump with a T perforator will also cause a "shorter" stamp! Below, I have placed the normal stamp (left) next to the perforation jump stamp (right) so that the top perforations are all in a line. The red lines at the bottom mark the difference in height caused by the perforation jump. I like to collect tagging jumps, perforation jumps... but I usually don't bother with coil jump pairs (I think the preferred format is strip of 4?). But that's for another future thread. Oh, I forgot. One more pic. To show that the side of the perforation jump stamp really is perf 14.25 instead of the originally measured 14.75, see the below picture. 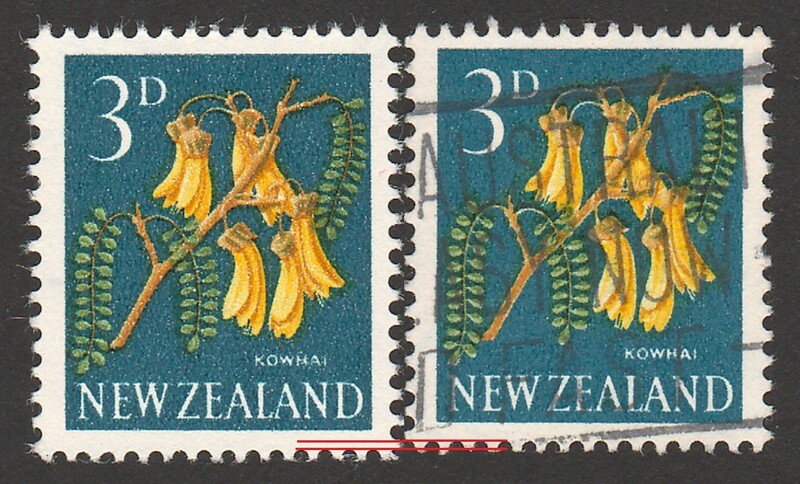 I have copied the bottom half of the stamp and pasted above the original stamp so that the horizontal comb perfs are perfectly superimposed (i.e., as if a pair were still intact). Next we measure the perforation of that complete section that has no perforation jump -- and we find it does in fact measure perf 14.25 as it should, instead of the anomalous perf 14.75 measurement we got when we included the perforation jump! 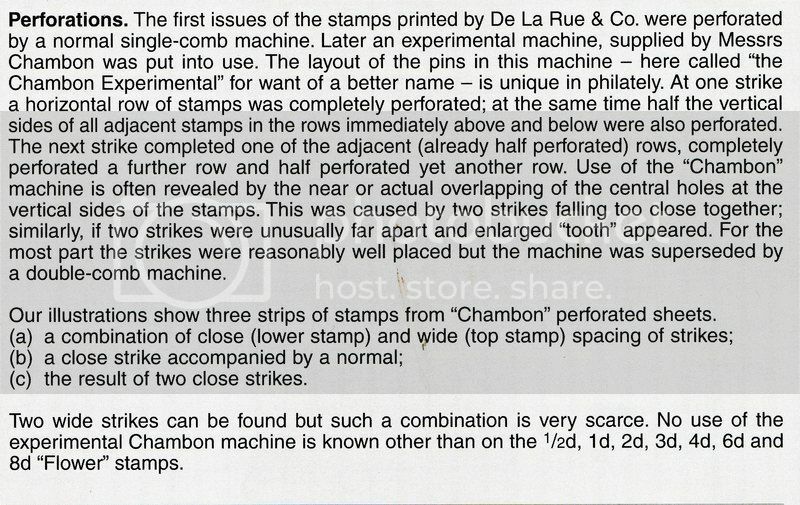 What you actually have here is what is known as a 'Chambon Perforation'. According to the Campbell Patterson catalogue it was an experimental machine which was used for several issues of this set. I will post up images from the catalogue tomorrow which should clear all this up. These type of varieties have a pretty good value compared with the normal stamp. I would do it now but it is well past my bedtime. Looking forward to seeing the catalog page, as I don't have the Patterson catalogue. Thanks! I see it exists for ½d, 1d, 2d, 3d, 4d, 6d, and stamps of this series. Hopefully this is what tomd has and I haven't carried this thread off to another topic! I will try to get some post in Saturday, work and my granddaughter is in the hospital, these have gotten my attention at the moment. Sorry to hear about your grand-daughter. Hope she has a quick and full recovery! Of course no rush on posting the stamp, but please do let us know how she is doing. tomd I hope your granddaughter makes a good and quick recovery. Hope all is well with your granddaughter Tomd. Here are the scans as promised. I will do them over three posts. This shows all the varieties. 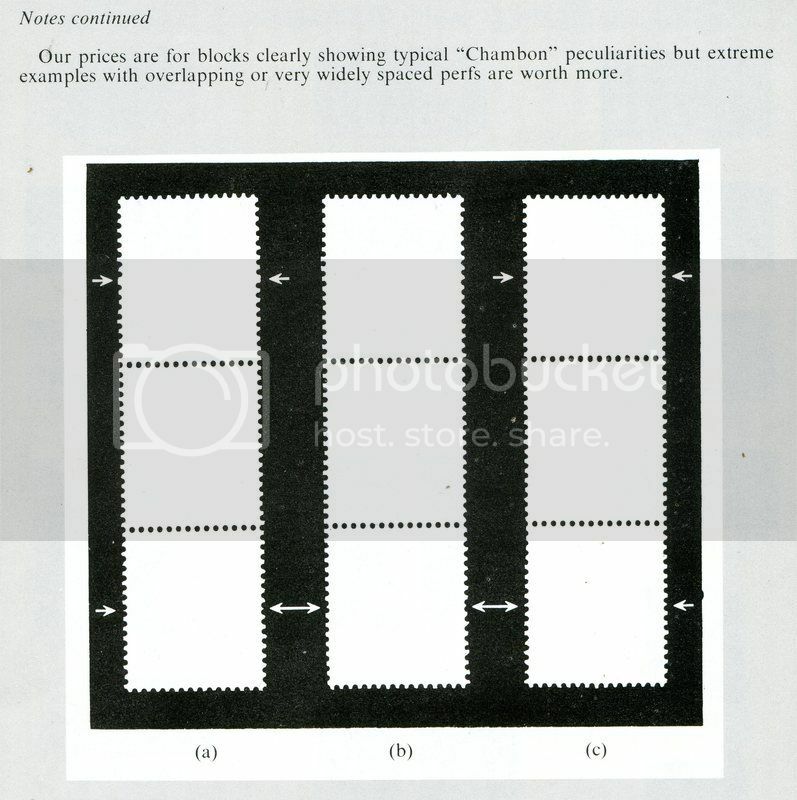 These scan are from the Campbell Patterson catalogue. Now regarding the perf question. I checked all my chambon perf copies and they all measure 14x14½. Therefore I believe that the catalogue is lacking a little information in that regard. Bear in mind my copy only has a 2007 revision so it may have been updated. Once you post up a scan Tom I am sure it will show the chambon perfs. One other thing to keep an eye out for here is that this was also printed on a chalk surface paper which I believe are a lot scarcer and hence more valuable. Also the thicker perf (instead of the thinner) seems to be a lot harder to source. I know Israel is one country that used this perforator but I don't have any examples to show. First, My granddaughter is still in the hospital and she has a very bad kidney infection. They have not found the cause as of yet but she is doing better.